^ Finoli, David; Rainer, Bill (2003). The Pittsburgh Pirates Encyclopedia. United States: Sports Publishing LLC. p. 262. ISBN 978-1-58261-416-8. http://books.google.com/books?id=1VwOLIVOWvwC&pg=PA262&#v=onepage&q&f=false 2010年9月12日閲覧。. ^ Pearlman, Jeff. 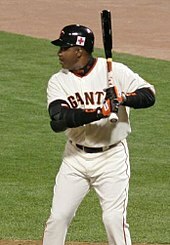 Love Me, Hate Me: Barry Bonds and the Making of an Antihero. Google Book Search. ISBN 978-0-06-079752-2. http://books.google.com/books?id=QIv7agRgVjEC&pg=PA143&lpg=PA143&dq=%22bobby+bonds%22+%22number+25%22+barry&source=web&ots=ZhHQPVP-52&sig=2uomExw01lPXMPJDWFwd06uE4kY&hl=en 2008年4月17日閲覧。.